Hello. 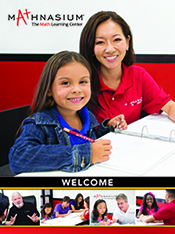 I'm Rafael Morales, Centre Owner of Mathnasium of Stouffville, your neighbourhood math-only learning centre. We help kids in grades 1 - 12 understand math by teaching the way that makes sense to them. My daughter has been going to Mathnasium in Stouffville for about 9 months now and she loves it! Not only does she love going there, she has done so well in her grade 8 year in regards to math! She is excelling in math and it’s so great to see her confidence in math growing! Thank you Rafael and staff for helping my daughter progress so well in math this year!! It's only been a month and my son feels more confident in his abilities and is enjoying math more. I also like the flexibility of dropping in whenever suits his schedule. I think you have made it fun for the kids. My son dreads going but once he is there he is happy with what he accomplishes when he understands it. The only item that I would say for improvement is you need more instructors (especially during the peak times). When you see a child staring at a sheet without doing anything for sometime, you know they are struggling. Assistance at this stage is needed to help get them guided in the correct direction. My son is in grade 9 and was struggling to get the grades that he wanted. Since joining Mathnasium his grade have drastically improved, he is happy to go to Mathnasium and always leaves with a smile on his face... what more could a parent ask for? Expand hours of operation to include Friday’s and till 4 o. Saturday’s. Otherwise all good. You keep our child engaged. Never any complaints about going. The model used to teach math makes sense and is rewarding. The staff are knowledgeable and friendly and now in a few months my son went from disliking math and feeling like he was no good at at to loving it and asking to spend time at mathnasium over attending sports and playing games. Our Grade 6 & Grade 4 have thoroughly enjoyed Mathnasium. They started just after it opened and continue to have a positive experience while there. In the past we have tried tutors but we find the consistency of the Mathnasium program, flexibility with 'drop-in' times and the reporting to be much more advantageous. We also feel the material taught there relative to our kids learning at school. Oftentimes they have learned the unit at Mathnasium ahead of their class at school. We continue to support and recommend Mathnasium Stouffville. Ben loves it. He feels so much more confident and learning more everyday. Rafael's passion for helping his students is what stands out with his Stouffville location. He always puts the students first and does whatever it takes to ensure his students are grasping the concepts they need to. My daughter is always excited to go to her Mathnasium classes each week. She has learned so much. They really do focus on the core math concepts that are individualized for each student's needs. We continue to watch her grow. a big thanks to the Mathnasium staff for their dedication in helping my daughter feel more and more successful each day. My son loved going to Mathnasium. If there was Before & After care available, I'd register him for sure. In the meantime I look forward to taking advantage of occasional specials for my son to attend every now and then. Nicholas is doing great in math so far this year. Says its "easy". Thanks so much! Only I can say is that my kid is happy going there, so I am happy. Mathnasium was recommended by a friend who's daughter excelled with the program. My son is enthusiastic and motivated, we have passed on the contact info to another friend for her granddaughter. THIS is how to teach math!!! The tutors here are knowledgeable and helpful. My son has improved his math skills dramatically after couple of months study. He is a grade 4 student and now promoted to grade 5 math at Mathnasium. Rafael is like a second dad, making sure the kids are on track with their math! Fantastic! Rafael is very involved in each individual child's progress and takes an active interest in their unique learning. The methods at Mathnasium simplify math for kids and create an enjoyable understanding of the concepts. With this newfound understanding my child is much more confident in her math skills and this is reflected by her increasing grades and decreasing fear of tests! Thank you Rafael and Mathnasium! The staff are so supportive and motivating that my son wants to go. He is making great progress which shows in his report card. The program has really helped our son to understand basic concepts and given him the tools to move on to more complex topics. The tutors are great and he enjoys the time he spends at the centre. His marks have improved and he's consistently getting A's! Thanks for this great service! Gordie has said he is so confident with his multiplication - he was pretty good before with multiplication, but after only a few weeks, he is extremely confident in his abilities. Although my daughter has only been attending Mathnasium for a month, her confidence has skyrocketed. She leaves happy and ready to tell us about what she had accomplished during her session. Our son looks forward to attending and is enjoying leaning math. I love it. Even better, my kids love it! Everything about the atmosphere, the teachers, incentives, and lessons make my kids wanting to come often. Thank you Rafael, for bringing Mathnasium to Stouffville. Mathnasium has been such a positive experience for our daughter! All the staff are pleasant and Raphael is very welcoming and knowledgeable. I would highly recommend it to anyone.